also planning to form the Beekman Street Arts District Association. Eden Compton Studio & Gallery, became the most recent fine art gallery to open in the Beekman Street Arts District in Saratoga Springs, holding an open house for its 2018 holiday show and sale in December. The event featured the work of five established and well known artists in the upstate New York including Ann Larsen, Takeyce Walter, Matt Chinian, Kate Edwards, Rita DiCaprio and Eden Compton. Eden Compton Studio is both the personal workspace of artist Eden Compton and a fine art gallery. The artist’s landscapes, cityscapes and portrait commissions are available at the gallery as well as the work of other established artists. She said the studio plans on hosting several big exhibits throughout the year. The artist was attracted to the Beekman Street area because of its historical significance as an Arts District. She said she is working with several other business leaders on Beekman to form a new Beekman Street Arts District Association and will be the chair of the new nonprofit organization. The purpose of the new nonprofit will be to promote the street and its businesses as a “destination stop” for tourists and locals alike with events and arts related activities. Compton was born in Texas and raised in Connecticut. She and her New Zealand-born husband, Richard, have settled in upstate New York after two decades of sailing and managing private charter boats in the Caribbean and throughout the U.S.
“While my extensive travel has sparked an interest in different types of subject matter ranging from rural landscapes to rainy cityscapes to market scenes, I am particularly drawn to portraiture and figurative subjects. I am fascinated by the stories that any given face can reveal. I love the narrative of portraiture,” she said. Eden has accepted commissions for both children and adult/family portraits in oil or pastel. “My landscape work is an attempt to synthesize memory painting based on observation with my plein air studies,” she said. “It begins with sketches and drawings done on location and then completed in the studio where I can spend more time developing the concept of the painting. In addition to her travels, Compton credits the works of her grandparents, Carl Benton Compton and Mildred Norris Compton, as another strong influence on her own paintings. The Comptons reflected Mexican culture through their modernist and often surreal artwork. They painted alongside Diego Rivera and Freida Kahlo and spent the summers in Guanajuato throughout the late 1930s and 1940s. Compton’s formal art education began with a B.A. in art history from Colgate University and independent courses at the International Center for Photography in New York City. She has studied with master pastelist Doug Dawson and taken workshops with nationally known artists such as Alan Flattman, Lois Wooley, Colin Page and Donald Jurney among others. 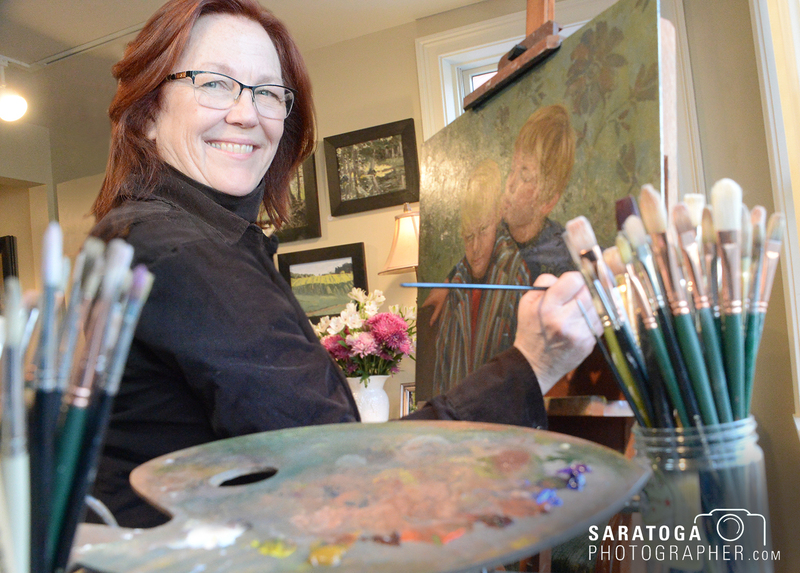 Her award-winning work has been included in national juried shows including the Catherine Lorillard Society, Salmagundi and the International Pastel Society as well as numerous regional and local shows. She is a juried member of the Degas Pastel Society, Oil Painters of America, Portrait Society of America and an Associate with Distinction of the American Women Artists Association. The studio is located at 74 Beekman St. Its website is edencompton.com.